Maverick resting during a hike at Mt. Rogers National Recreation Area. * This was written and posted on my prior site in March 2015, I want to keep this story online as a memory to Maverick. I have introduced my dogs on my Facebook page and Jackson has been a hit in that virtual world so it’s time for their debut here. Regretfully only one is still present my other, Maverick, passed over the Rainbow Bridge not too long ago. I haven’t written much about the loss of Maverick, a 14-year companion of mine. 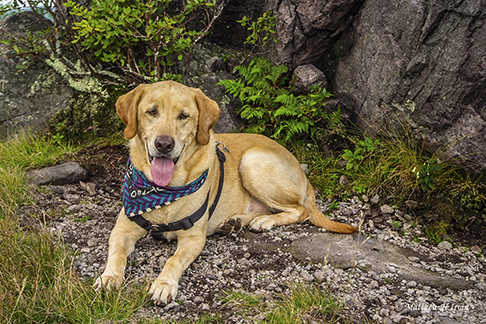 Maverick was a Labrador retriever, born on Christmas day in 2000. He went through quite a few big events in my life; a relationship break-up, care and the death of my ageing father, a chaotic job history during my time back in Norwood to care for my father, and my own cancer diagnosis (those were just the major highlights.) As with any dog Maverick had his own quirks and special personality, he was born on a turkey farm in Stanly County and as with all my dogs past and present was a close companion. He loved to swim, to the point when it was time to leave, you had to do it on his own time, or go in the water and get him out. When he was in the water that was his only thought, calling him, tempting him with toys or food didn’t work. The usual rattling of the keys and “Let’s go for a ride” fell on deaf ears. That was one of his quirks and I quickly learned to leash him near any body of water. My brother didn’t believe me until we were hiking near a tributary of the Uwharrie River that was quickly flowing from the runoff of spring showers. Maverick had gotten ahead of us and jumped into the swift-flowing stream. We had to run down stream on each bank of the creek using the leash to “lasso” him. If we hadn’t caught him, who knows where he would have ended up, maybe miles below swimming on Lake Tillery heading down towards the dam. 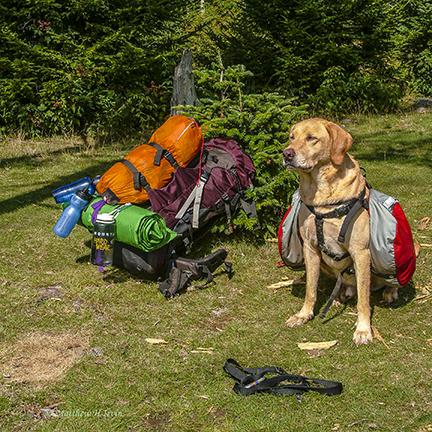 Maverick proudly shows off his backpack and is ready to move on to the next campsite. There are more stories of Maverick and our escapades, many backpacking and camping trips among other times. The funniest that comes to mind is on a backpack trip to the Mt. Rogers area of southwestern Virginia. After a day of hiking to one of my favorite spots on Wilburn Ridge we were greeted by a wild pony, there is a herd of wild ponies in the area, in our campsite. Maverick’s reaction to our curious visitor was priceless and when the pony finally came close enough to sniff him, he bolted, not sure what this large “beast” was going to do. 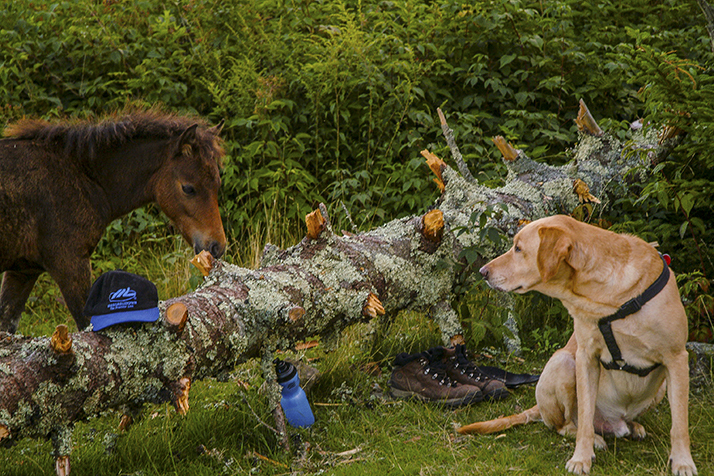 Maverick and a wild pony meet at our campsite at Wilburn Ridge. Almost five years ago Jackson was added to our pack, I usually rotate dogs in the latter years of another, so sometimes I have one dog and sometimes two. Jackson was a lively addition and Maverick was young enough to enjoy another dog. One thing I did after adding Jackson was I put Maverick’s the pack on him. It had already become evident Maverick was having problems walking from spurs on his spine, so I thought this would help him out. Well I had never witnessed Maverick so upset and distressed. 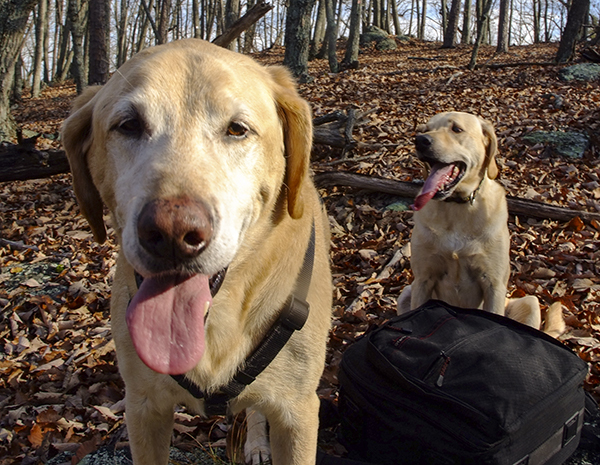 He must have been thinking, “What was this young upstart doing with my pack on?” I quickly took the pack off, that was four years ago. I never had the heart to put it back on Jackson until recently. Maverick always knew the pack meant a trip and camping and was excited to see it. In early March Maverick had succumbed to his ageing body, he was no longer able to walk. I had been caring for him for several days in this condition, bringing back memories of how I cared for my father in his time of need. The hardest time, as it always is, was the visit to the veterinarian. Maverick was a joy in my life as all my past dogs have been. As others have lamented I am always sad that our furry companions don’t live longer and wish they could be life-long visitors by our side.